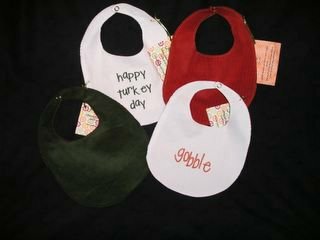 turkey time is just around the corner, and these "gobble gobble" bibs will make sure that your baby wins the "best dressed" award at the kid table! These bibs are made from a deliciously rich corduroy in white, forest green, or burnt orange. These fall colors bring crisp fall leaves to mind, but are much softer against baby's skin! Shown in medium, these bibs measure approximately 7.5" x 9.5", and are secured with a baby-proof snap. Monogramming is available.